This extremely unique custom design is one of the largest homes we’ve produced, and has a very sleek and modern exterior. Coming it at almost 6250 square feet, this estate house plan is truly remarkable. 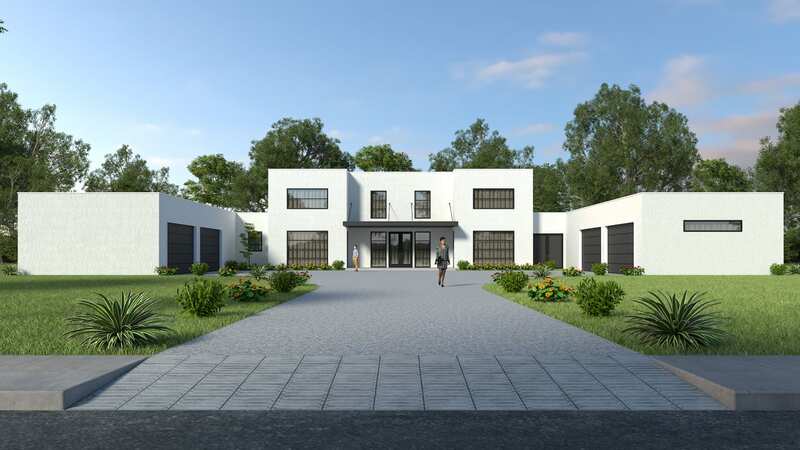 The nearly symmetric exterior is striking, with the main house flanked on either side by two four-car garages and shops, perfect for the car enthusiast or tinkerer who needs a ton of space. The entire home has a sense of balance, from the garages to the layout of the bedrooms to the matching patio access at the rear of the home. The grand foyer opens up to the centrally located staircase, and is open above to the array of bedrooms upstairs. On the other side of the staircase is a grand fireplace and a spacious 25′ x 26′ great room. There is an ultra luxurious den/study on the right side of the great room that has plenty of built-ins, a large fireplace, plenty of closet space, a view to the rear of the home, and two access points outdoors. In addition to the grand great room, there is a 32 1/2′ long family room just off the kitchen that spans the entire left hand side of the home. It also has a fireplace and has many windows out the rear of the home and french door access to the large covered patio, perfect for entertaining. The kitchen is tucked behind the formal dining room, and has a large central island, plenty of counter space, and access to the backyard and covered patio, making serving for parties a breeze. Also on the main floor is a full guest suite, a second smaller office, and a full bath with full sized shower and two sinks. The master and the additional bedrooms are all nestled upstairs, each occupying a corner of the floor, and each with a walk-in closet, full bath, and tons of natural light. The master suite in particular is quite luxurious, and includes a large fireplace, private deck, generously sized bathroom, and an equally generous walk-in closet. We’ve also placed the utility room upstairs in the front right corner with easy access from the master suite, making doing laundry a breeze. Don’t miss out on this truly unique and remarkable modern masterpiece!